Given its culture of low levels of credit and the predominance of fixed-rate mortgages, it would be natural to assume that house prices in the Republic evolve slowly. Whilst there was no boom and bust scenario per se before, during and after the GFC (global financial crisis), prices are comparatively very high compared with a decade ago. 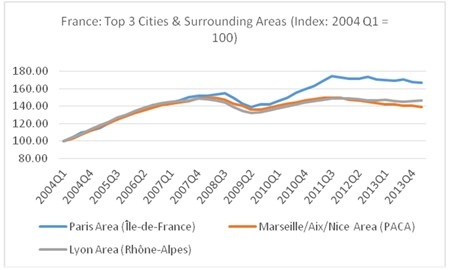 Unsurprisingly for such a centralised country, prices in the Paris area have risen at a higher rate than their equivalents in Lyon and Marseille. Whilst property values in France’s second and third-largest populated areas have risen steadily in the last decade, they have both seen around a 40% rise - a steady return on investment. One of the main triggers of the GFC was, of course, the bursting of the US property bubble. The Federal Reserve’s reaction to this was quantitative easing (QE) - adding huge sums to the money supply in an attempt to boost markets, such as property, by making borrowing more affordable. It is clear from a real estate point of view that QE isn’t working. 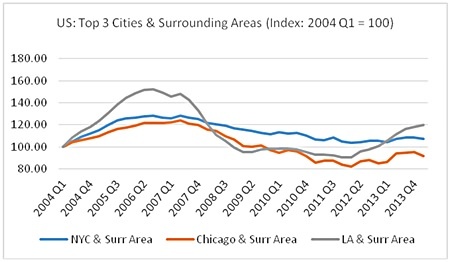 Whilst prices in the Los Angeles area have grown a respectable 10% in the last ten years, the New York area has gained just 7.5% and Chicago has actually dropped 8% in price. Whilst the US housing market is stagnant at best, after the first quarter of 2014, the Spanish national average price was an eighth lower than ten years previously. 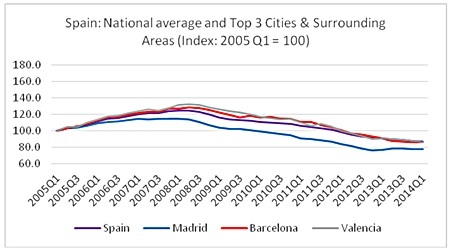 Breaking this down into the three most populated areas shows a similar story for Barcelona and Valencia; Madrid faired even worse with prices over 20% below their level a decade ago. Spain’s housing bubble had been going on for ten years when prices started to fall in 2007-2008. There had previously been a boom between 1985 and 1990. Whilst this surge levelled out in the 1990’s prices were still rising overall. The current situation is totally different, however: the property bubble began to burst a few months before its American equivalent and is still deflating. Analysts may suggest this is a buyer’s market; but with prices so low for six years, it raises the question as to what extent property will regain value and thus bring any reasonable return on investment. Spain is very much the doomsday scenario, of course, and local policy is constrained by Spain being in the Eurozone - meaning the policy-making central bank is based in Frankfurt and has 17 other countries to concern itself with too. Nevertheless, it still provides a relevant example of how a housing market can burst uncontrollably. The central banks in Australia, the UK and elsewhere should take heed. So too should investors, when contemplating putting money into bricks and mortar. The best long term property data (300 years of Amsterdam data) is an excellent hedge against inflation that also produces income. Research by Ian Gordon1 confirms our belief that property may benefit during 3 of the 4 long wave economic cycles. However, this could well be the period for many property markets when we’re in the part of the cycle that doesn’t and the reversion to mean may be a very mean experience for many property investor and speculators.